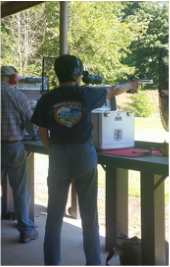 The most popular form of pistol target shooting in the US. Competitions are held in every state, outdoors in the summer and indoors during colder/snowy months. The National Championships are held every year (usually July) at Camp Perry, Ohio. USA shooting is the governing body for International competition in the U. S. The Olympic Training Center in Colorado Springs is the home of the US Shooting Team. The 50 meter indoor range will accommodate 29 shooters and when used for Air Pistol about 70 positions are available. The course of fire for Air Pistol (first pistol ) is 60 shots--10 meters--time 1 3/4 hours. Shooters fire at steel silhouettes of animals placed at a distance of 40 to 100 meters. A typical match consists of 10 shots each of the four silhouette types for a total of 40 rounds. 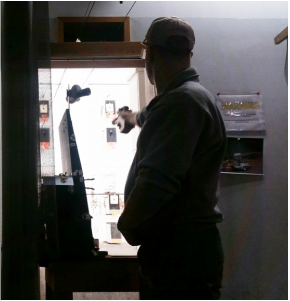 American handgun silhouette competition is sanctioned by the NRA and by the International Handgun Metallic Silhouette Association (IHMSA). Focused on defensive shooting such as drawing the pistol from the holster, movement, fast target acquisition and multiple targets. NRA Action Pistol and the International Practical Shooting Confederation (IPSC) are two of the best known practical pistol sports. Other practical pistol sports include Defensive pistol, bowling pin shooting, and Steel Challenge shooting.